After a day without news, Horst phoned in again just now. 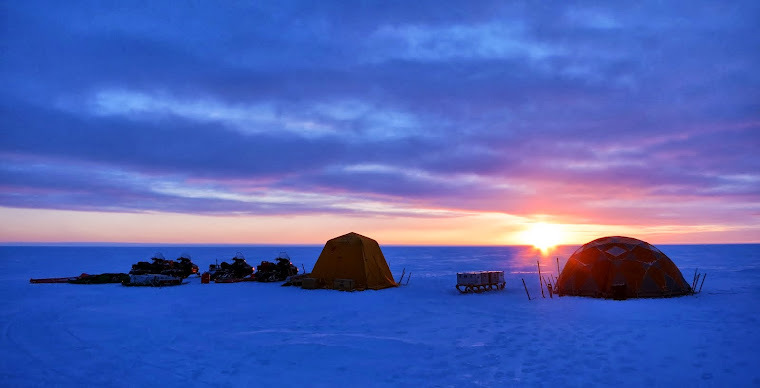 Yesterday they traversed to the Camp 2 location, and when I asked how it went he replied "terrible, difficult". One skidoo broke down, forcing them to camp halfway. They got the machine running again with instructions over the phone, luckily. But during the rest of the trip, amongst other difficulties, one of their fuel barrels got punctured, twice... Horst was surprised how much stuff they still have to drive around, even after the departure of half of the team. At the moment conditions up there are still 'good', with -28 C and blue skies. But the forecast tells them that there will be another turn for the worse, with snowfall and high wind speeds. The weather is definitely not cooperating this season. It is amazing how much the group has accomplished in spite of the ongoing climate attack! Then again, there wouldn't be an ice sheet if the weather was fair all the time.